You would be surprised at the number of real estate agents to choose their twitter handle poorly. You need to remember that when people see your Twitter name, they will associate that name with you. While I haven’t seen any real estate agents with a twitter name that really belongs in a frat house, I’ve definitely seen some that are a bit questionable. If you have not registered a twitter handle yet, here is some thoughts and ideas on the types of names you should choose. If you are fortunate enough to have an unusual combination for your first and last name, this should likely be her first choice of twitter handle, or at the very least you want to save it for future use. If your first name last name combination is available, really resist the temptation to just stick a 1 on the end of it, as twitter will often suggest. When it comes to marketing, depending on the font used, that one can look like an L and lead your potential followers astray. The same goes for the number 0 and the letter O. You want it to be as easy as possible for someone to type it into Twitter and find you, you don’t want to lose them because they have to play the “what letter or number is this?” game. If you can’t get your name, you can be a bit creative but remember that the purpose is real estate. Maybe you can grab @cityrealestate or @townrealestate or @airportcoderealestate. The last thing you want to do is build your brand on Twitter that is very closely tied to the specific real estate company you work for, by having it anywhere in the twitter handle. You may think you’ll always work for Coldwell Banker or RE/MAX or whichever company currently work for, but you never know when you might end up jumping ship, and that @RemaxLinda username will definitely be a hindrance. Not only will you have to rename your Twitter account, but you will have to rebuild that brand again, and some of your followers might not immediately recognize that @RmaxLinda is now @LindaSmith and unfollow you. You can always choose to go with @LindaSmithRealty or @LindaSmithRealtor if @LindaSmith is taken, to make it easy for people to remember and find. Before you go the route of adding a word on the end, you want to make sure that the person who owns your name isn’t posting questionable content you don’t want to be associated with. It is easy for someone to mean to type @LindaSmithRealty only to end up on @LindaSmith – when first impressions are everything, you want to make sure that the other person with your name can’t hurt your image by posting racist rantings or is a college aged girl posting about her bar hopping weekends. Just because you love dogs, or cats, or the San Francisco 49ers, that doesn’t mean that your potential clients will. Not only that, you could confuse your potential real estate followers by thinking your tweets are only can it be about the 49ers or cats, when in reality you are posting a lot of helpful local real estate listings, tips and community events. Do you already have a twitter handle and you’re concerned that it might be hindering you because of the name you chose? Our positive side, you can make a change and rename your Twitter account. But again because you want to build up the brand – and use it on written literature such as business cards, printed listings and advertising – think carefully before you make the change, and plan to make the change permanent. This is one area where being whimsical and changing your name every month will not pay off. Never forget that what you’re twitter handle is represents you and your personal real estate agent brand. So think about the name carefully, but don’t delay too long in registering as there are thousands of new accounts created every single day. 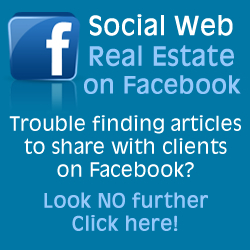 What are the best times for real estate agents to share on social media? Are you failing to promote your social media accounts effectively? Is your real estate site mobile friendly?